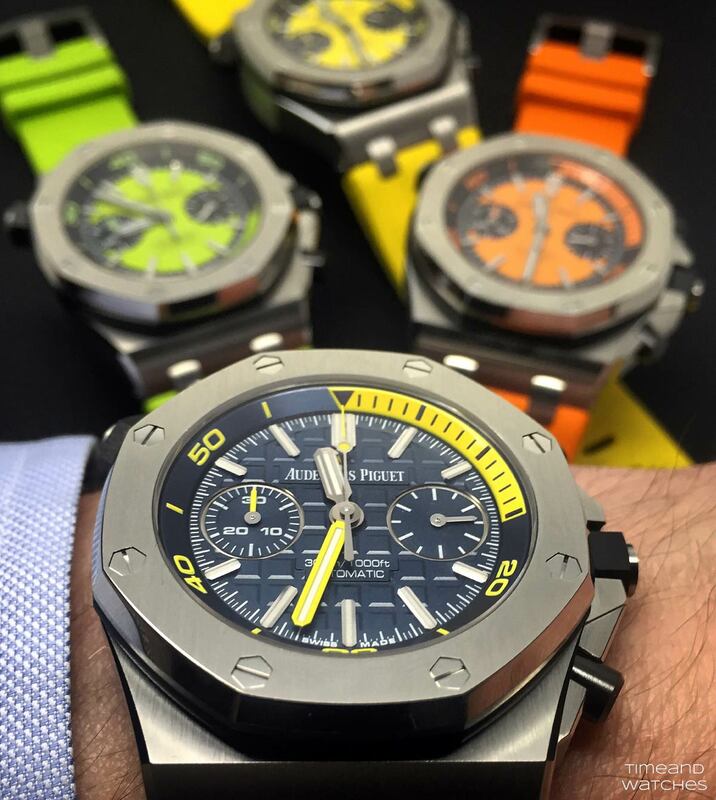 At SIHH 2016, Audemars Piguet launches the new Royal Oak Offshore Diver Chronograph here presented in four versions characterised by funky colours and exclusively available in the boutiques of the brand. 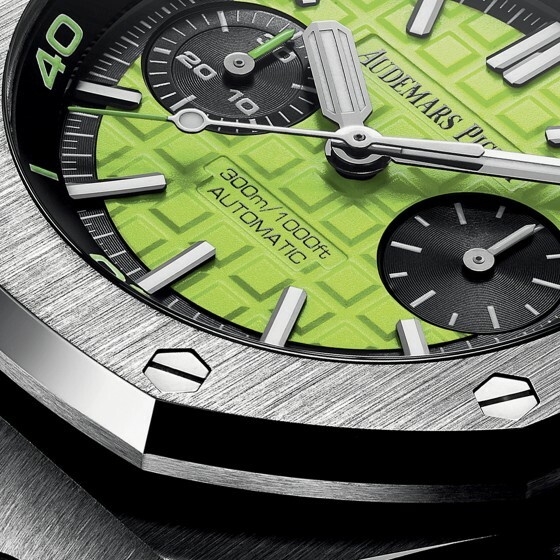 The robust 42 mm stainless steel case frames high-contrast tangerine, lime, citron and blue dials with "Méga Tapisserie" pattern on which the hands and the hour-markers stand out very clearly. The black pushpieces and screw-locked crowns are crafted from ceramic. 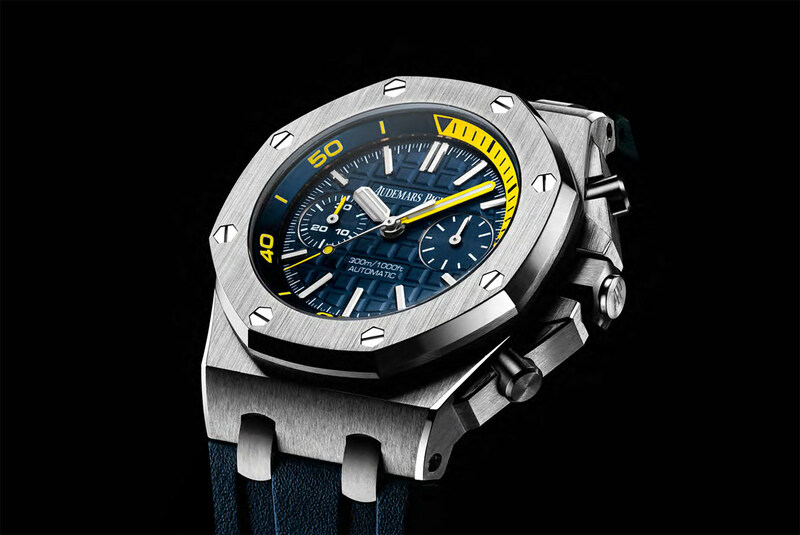 The diving function indicator has been highlighted for better readability at depths of up to 300 metres. 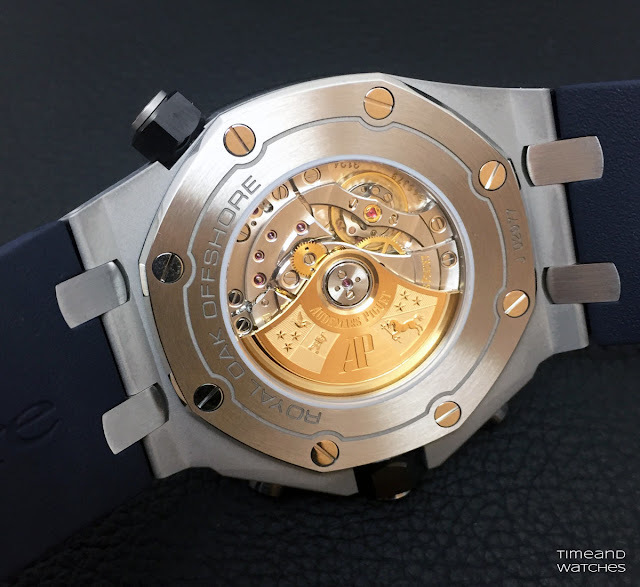 The movement of choice is the selfwinding in-house Calibre 3124/3841 beating at 21,600 vibrations per hour (3 Hz) with a guaranteed power reserve of at least 50 hours. Blue dial, blue counters, white gold applied hour-markers and Royal Oak hands (yellow minutes hand) with luminescent coating, blue rotating inner bezel with diving scale and zone from 60 to 15 minutes in yellow. Matched to a blue rubber strap with stainless steel pin buckle. Orange dial, black counters, blackened gold applied hour-markers and Royal Oak hands with luminescent coating, black rotating inner bezel with diving scale and zone from 60 to 15 minutes in orange. Orange rubber strap with stainless steel pin buckle. Yellow dial, black counters, blackened gold applied hour-markers and Royal Oak hands with luminescent coating, black rotating inner bezel with diving scale and zone from 60 to 15 minutes in yellow. Yellow rubber strap with stainless steel pin buckle. Green dial, black counters, blackened gold applied hour-markers and Royal Oak hands with luminescent coating, black rotating inner bezel with diving scale and zone from 60 to 15 minutes in green. 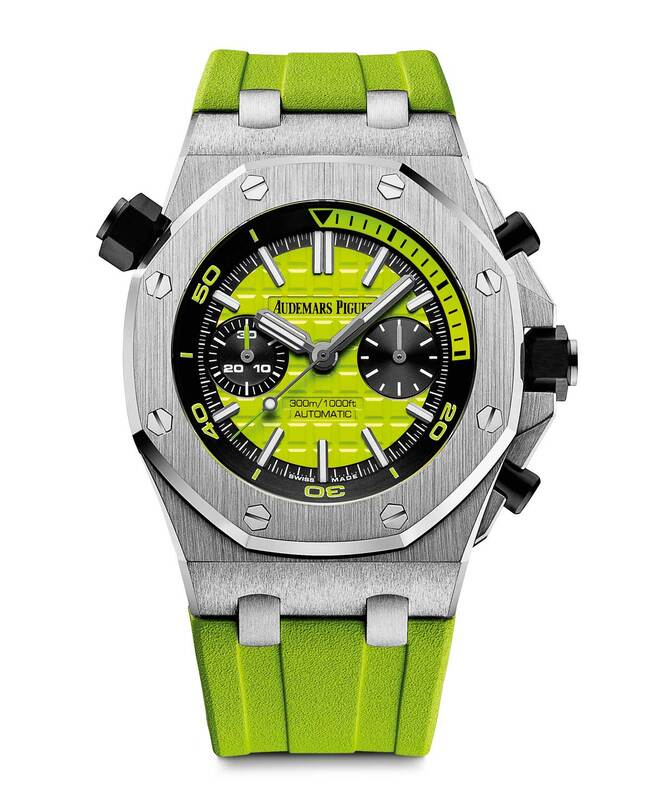 Green rubber strap with stainless steel pin buckle. This version will exclusively be available at the Audemars Piguet boutique of Geneva. 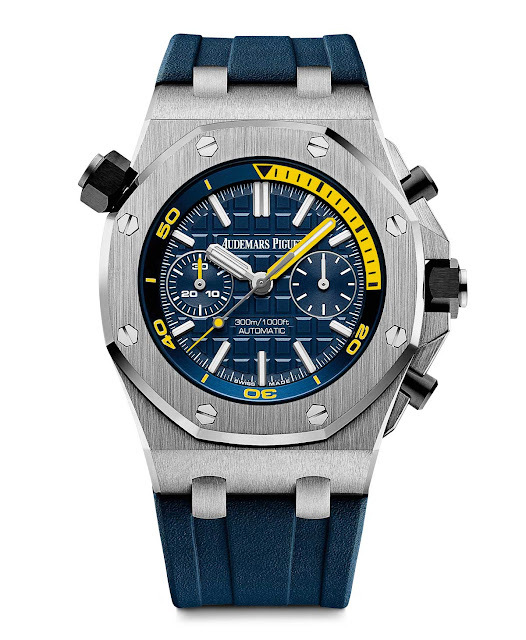 SIHH 2016: Audemars Piguet Royal Oak Offshore Diver Chronograph 42mm. At SIHH 2016, Audemars Piguet launches the new Royal Oak Offshore Diver Chronograph here presented in four versions characterised by funky colours and exclusively available in the boutiques of the brand. The robust 42 mm stainless steel case frames high-contrast tangerine, lime, citron and blue dials with "Méga Tapisserie" pattern. The new Audemars Piguet Royal Oak Offshore Diver Chronograph 42 mm will have a price of Euro 28,000.